Price is for an Outer Banks, NC all day offshore fishing charter, includes up to 6 passengers. Price does not vary with less than 6 people. Return time: 3:30 – 5:00 PM. A deposit is required secure your trip. Tips- It is customary to tip your mate 15-20%, whose hard work makes your day a success. Fish cleaning- available on premises for a per pound charge. Please feel to contact us with any questions you have regarding your trip. We recommend bringing the following items onboard to help ensure a comfortable Outer Banks charter fishing experience! If you have any questions about what is provided on the charter boat, please feel free to reach out to us and we will be more than happy to help. Does it cost less with fewer people? No. The number of passengers does not affect the cost, we have a flat fee of $2100-$2170 regardless of if there is one person or six. We do have a maximum limit of six people per trip. Do we need to bring rods, bait or tackle? No, we supply custom rods along with bait and tackle for you! How long does it take to get to our fishing grounds? This varies, but typically takes one to two hours to arrive at our fishing waters depending on where the bite is and ocean conditions. You can take advantage of our satellite TV during travel! No, you do not need a fishing license. Is Hog Wild kid- friendly? Yes! We are kid-friendly. Charter boat fishing is a wonderful Outer Banks family vacation tradition! Yes, alcoholic beverages are allowed within reason for those of the legal drinking age. What types of fish do you typically catch? Although there are no guarantees on what the Gulf Stream waters will bring, our guest fishermen and fisherwomen typically catch a variety of fish on our trips! In the summer season we will catch Dolphin (Mahi-Mahi), Tuna and Wahoo. In September and October we see an increase in White Marlin. Throughout both the summer and fall seasons, there is always the possibility of catching a White Marlin, Sailfish or even the prized Blue Marlin! Take your first right into Pirate’s Cove Marina and follow the road until you arrive in the parking lot beside all the boats. 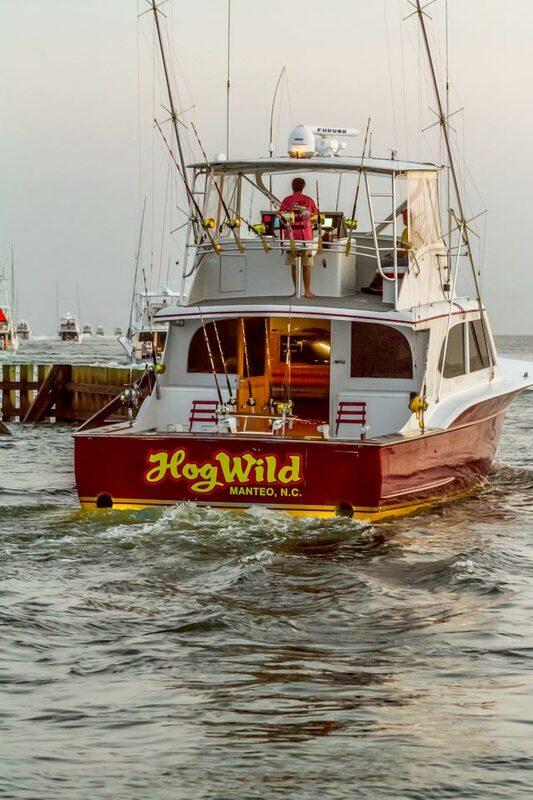 The Hog Wild is located right beside the fish cleaning station.